Home > Page 2 - Clear/White Arkansas Rock Crystal Clusters - Also See Page 1 > Arkansas Rock Crystal Plate Cluster with 'Flying Laser DT', No Matrix. 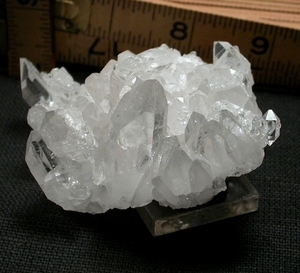 This high-energy Arkansas rock crystal plate cluster with a 'flying laser DT' crystal has no matrix but multi-layered doubly-terminated regrowth. Said laser spans 1" and is nearly centered above this diamond-shaped, rainbowed formation. Possibly more delightful is a clear doubly-terminated 3/8" crystal at the cluster's edge - what bravado! - and its' in the company of others sparkling around the points. 2-3/4x 3-1/2x 1-1/2" flat, small cabinet sized. Only the largest point, 3/8x 1-3/4" has a fleabite: the rest of this cluster is damage-free, with plenty of rainbows from Montgomery County.